In June of 1985, I was approached by a good friend of mine Frank Spry, (Corinthians CC) who sadly is no longer with us, to have a crack at Janet Tebbutt’s Exeter to Plymouth and back record, a distance of some 83 miles on the undulating A38. I chose the date 13th as I was born on the 13th (Friday as well) and that October would have favourable winds or so I was lead to believe. If successful it would be a good end to a good season. I had only been racing for 3 years and still very much a novice, especially in record attempts but I knew what I was letting myself in for, as I had been racing quite regularly on the A38 and was fully aware of the terrain Frank Spry also knew of my capabilities as he had been one of my many followers in my progress in cycling. 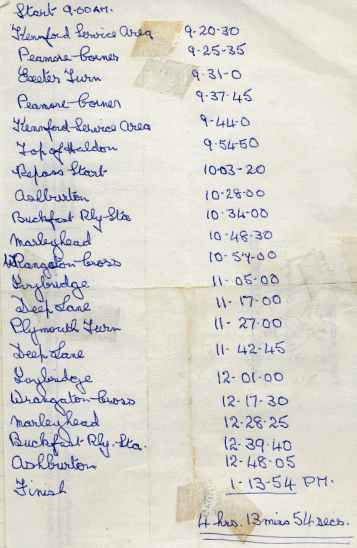 Frank organised everything; the time keeper, Wilf Perry, also no longer with us, marshals, and notifying the Western Counties Road Records Association, W.C.R.R.A, which he did three months in advance. In the mean time Mick Fagg managed to borrow a car from Stuart Wilson to drive Wilf, himself and my spare bike, should I need it. Stuart had not long set up his own catering business, called Supersandwich, and with his company name all over the car, it was an ideal way to advertise. 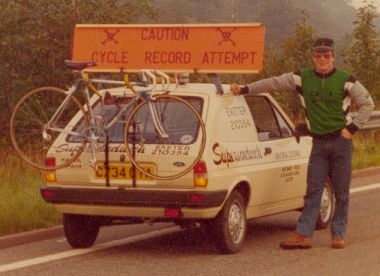 To finish off, we had a big banner on top of the car with ‘Caution Cycle Record Attempt’ all across it, so that people could see what was going on. Mick and Stuart were both in the C.S.Dynamo in Exmouth and I was riding for the Wyvern C.C. for the second year. I rode for Wyvern after Pauline Strong had shown some interest in me at races; after a few meetings and discussions I joined. 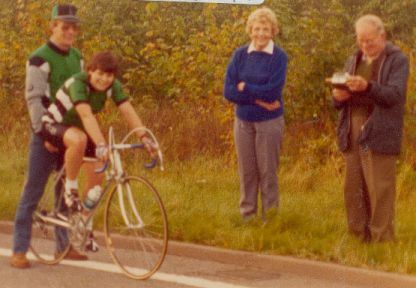 I was then eligible to ride for Wales (Granddad being Welsh helped) and set off to road races up and down the country with Pauline and Claire Greenwood. On the day of the attempt I chose to ride in C.S.Dynamo colours as a thank you for all the help and support I was getting. It was also my way to advertise what was a fairly new club for the local newspaper. Frank had arranged for Radio Plymouth to be at the finish. What a star he was!!! Leading up to the big day, Frank had notified Janet Tebbutt so she could come out and watch. Janet only got this record in July so it must have been agonising to watch her record being broken. At the time I didn't know Janet was coming out so it was a nice surprize. The day before the attempt was busy as I was asked by the local radio station, Radio Devon, to come in and talk them through the schedule. Rupert Allison another member of C.S.Dynamo worked next door at Devon air and he had arranged for them to do an interview with me. Their station was in Exeter, so I only had a short bus ride and a little walk to get there. The interview went well and I felt privileged to be there. I didn't feel nervous which was most strange, I answered any questions and told them what my schedule was, in what I hope was a professional manner. Apparently my mum was tuning in and told me at a later date that she was impressed, and that goes a long way in my eyes. In the evening I had arranged to meet Frank in the local pub at Topsham, near Exmouth, not far from where I was living. He had driven all the way from Plymouth to show me the schedule that he had worked out. Janet's record was 4hrs, 33mins and 24secs and my schedule was for 4hrs and 24mins, Frank had every faith in me and so I trusted him. Frank thought that I should ride the hardest part first, get it over and done with, from Chudleigh Knighton to Exeter and back which was 22 miles, and riding up Haldon Hill would be difficult because of the traffic. So I agreed. Frank was a little concerned that I now had two pints of Guinness in me and that would ruin my chances, I told him I always do good rides on Guinness and it will aid me to sleep. We said our goodbyes and I walked the one and a half miles home. It seemed to take a long time as I was now realising what lay ahead in eleven hours time. Normally I didn't sleep too well the night before a race, but that night I slept well, maybe because I wasn't too worried about it or maybe it was the Guinness. The morning of the 13th soon came and I remember I felt unpressured and at ease. After a few photo's and a briefing I was ready for my challenge. Mick was ready in the drivers seat, with Wilf in the passengers seat. Wilf instructed Mick that if he drove within 100 meters of me, I would be disqualified; I never understood why, it's not as if I'd gain anything. The weather was dry and sunny with a slight headwind to Exeter, the time was 9am and the starting point was Chudleigh Knighton. After a mile I had to climb up to Haldon Hill, it was a cruel start as the climb was about one and half miles long, but once up it was down hill all the way to the turn. I got to Exeter at 9.31 a distance of about 12 miles. The approach to the turn had a set of traffic lights, which was manned by a friendly policeman who kept them green both ways. The turn itself was underneath a railway bridge and there wasn't much room to do a dead turn around a marshal but I managed it, and was happy to hear that I was 3 minutes up on schedule. I made my way back out of Exeter and I recall climbing back up Haldon Hill. The start of the A38 was 4 lanes wide and as the road grew steeper, I had to ride across 2 fast lanes to get to the start of Haldon Hill. For anyone who knows the road, the A38 splits a quarter way up the hill with Telegraph on the left and Haldon on the right. Apparently Mick drove a bit close to stop cars from driving in between us, as it was a car just did that. Wilf saw that Mick had driven too close but accepted it as a safety reason. I felt safer once on Haldon Hill as I could now concentrate on the task ahead. It was half way up that an onlooker shouted at me to slow down as he thought I would blow. I thought don't be daft, I'm not slowing down for anybody, I might be in trouble later, but as far as I was concerned it was all or nothing. Haldon Hill is about a mile and a half long and I was using 52x17, God knows how I got up there, I still think about it now and if I was to have a rerun climbing it, I really don't think I could do it. I was hard then!!!! I reached the top with a sigh of relief at 9.54 and by now I was 14 minutes up on schedule. I had done about 19 miles, so I wasn't hanging about. At the time there weren't computers, tri-bars or disc wheels, I had no idea how far I had gone or how fast I'd been going, especially down Haldon. There was nothing aerodynamic about my ride and yet things were flowing. The wind had picked up and it was blowing me to Plymouth and I knew it was going to be tough on the way back. The A38 hasn't got much flat in it; it has some very long drags coming back from Plymouth to Ivybridge, and then there's the drag up to Marleyhead. It was about 10 miles down to Plymouth and I was determined to maintain my pace. When I got to the Plymouth turn at 11.27 I was a staggering 18 minutes up, but I didn't know that at the time. The marshalls did a wonderful job and I encountered the large roundabouts in Plymouth without a hitch. In town I was sheltered quite a bit but as I made my way back out I soon found myself battling into a rising headwind. The torture of the headwind and the climb back to Marleyhead was beginning to catch up with me. Mick told me later that I was down to 10mph and there was nothing he could do about it and he felt sorry for me, I was beginning to loose a lot of the time I had gained on the way down. Once I got over the worst of the drags I started to pick up speed again but it was still a long hard and very painful slog back to Chudleigh Knighton. The A38 was scattered with onlookers cheering me on with sorrowful faces but I remained positive as I had my mentor Frank signalling to me that I was still on target to break the record With eight flat miles left to do, I dug deep into my reserves, picking up speed to the finish and a huge crowd waiting for me. I felt like some hero that had just come home from a war. As soon as I crossed the line I stopped, just like the pro's when they finish a stage. I laid my bike down and I threw myself onto the grass, knowing it was all over but the pain was reminding me what I had done. The press was there from Radio Plymouth and Radio Devon to talk to me and my helpers. I knew how the pro's felt when they get a microphone shoved in their face. I was told that I had taken 4hrs 13mins and 54secs, breaking my schedule by 11 minutes, but more importantly breaking Janet's record by 19 minutes and 30 seconds. She was pleased for me. My mum had recorded the sports presenter on Radio Devon, so I could listen to him. He was clearly elated as he read out the news of my attempt. I was told that if it hadn't been for the headwind on the way back, I would have broken four hours, which only Ray Booty had done. Now there's a thought!!!!! I would say that was the best and most satisfying performance I have done, because of the way the whole thing came together at the end. The many friends who had supported me throughout the build up and for them to get me to the end with a record is something I will never forget and to my knowledge the record still stands.